I owe my job to Barbara Bush. No, she didn’t hire me. She may or may not have known that a Presidential Pet Museum existed. What she did do–what I have been grateful for since 1990–was to write Millie’s Book: As Dictated to Barbara Bush. I was nine years old then, with dreams of being: a). an author, and b). the president. (I wasn’t sure which would come first, and I didn’t much care.) As such, when I heard that President George H. W. Bush’s dog had written a book, my mind was blown. The First Lady, I thought, must be some kind of dog whisperer, or at least she was playing with convention (even if I couldn’t have explained what literary conventions were). I desperately wanted a copy. Of course, being nine, I did not have an income that would support such an extravagant purchase. Moreover, my parents were raising four kids on a single income, and–while they were solid Republican voters–the book couldn’t take precedence over the mortgage. Around this time, my fourth grade teacher announced that we were going to write letters inviting Mrs. Bush to read at our small elementary school. In my letter’s post-script, I asked her to send me a copy of Millie’s Book, citing the above financial situation. She never made it to our school (though she did write the class a letter), and I received no special packages. I finally got the book for Christmas. It’s the only thing I remember from my gifts that year. I spent the afternoon poring over its photos and reading Millie’s tale of life at the White House. I didn’t think much about Millie over the next two decades, although the election of George W. Bush in 2000 certainly reminded me of my youthful obsession with his mother’s dog. It wasn’t until January of last year when I realized how important that book would be to my adult life. “What do you know about presidential pets?” my friend Tricia asked over coffee. I told her what I’ve now told you. And so I read about the passing of Barbara Bush with sadness beyond what is typically appropriate for such passings. Her book had meant something to me, and the connection between author and reader is strong, even after three decades. Thank you, Barbara Bush, for the inspiration. I hope Millie is once again curled at your feet right now. President Bush with Ranger in Kennebunkport, Maine, Aug. 10, 1991. Photo courtesy: George Bush Presidential Library and Museum. Although Millie may have gotten more attention during the administration of George H.W. Bush, her puppy Ranger became the president’s favorite dog. Named in honor of the Texas Rangers baseball team, Ranger, a brown and white English springer spaniel, was the only male from Millie’s celebrated White House litter. Ranger and the president were said to have bonded almost immediately. First Lady Barbara Bush has even commented that George Bush and Ranger showered together, at least once anyway. Although the Bushes at first gave the puppy to granddaughter Marshall Bush, then 4, who lived nearby in Washington, D.C., the president called to invite Ranger to accompany him to Camp David for a weekend trip. When Bush suggested that Ranger arrive on Thursday for a Friday departure, the family decided maybe the pup should move back into the White House. 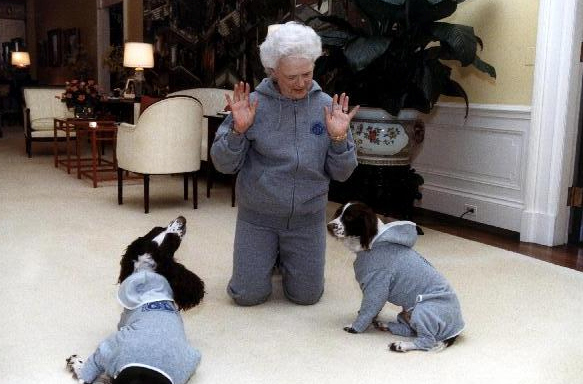 First Lady Barbara Bush wears matching sweatsuits with Ranger and Millie. 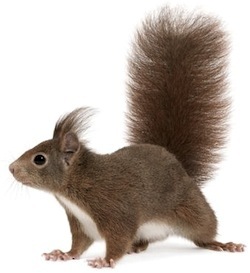 The rambunctious Ranger was said to have “terrorized the squirrels” at the White House. After the Bushes left the White House, Ranger was a familiar sight as he accompanied the former president during early morning walks in Houston. Sadly, the Bushes had Ranger, just 4 years old, put to sleep after he was diagnosed with cancer in 1994. “The pleasure George got from his dog Ranger taking flying leaps over imaginary logs cannot be described…. We have always lived in happy houses, but nothing matched this special place,” Barbara Bush recalled of the White House. 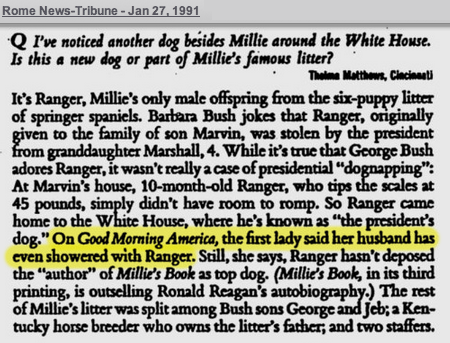 Another of Millie’s puppies, Spot, went on to live in the White House — during George W. Bush‘s administration. President George H.W. 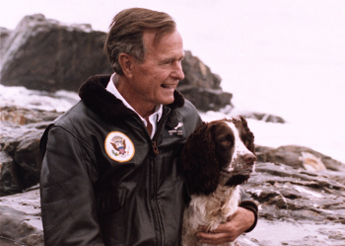 Bush’s dog Millie, a springer spaniel, was the first presidential pet to write a book. 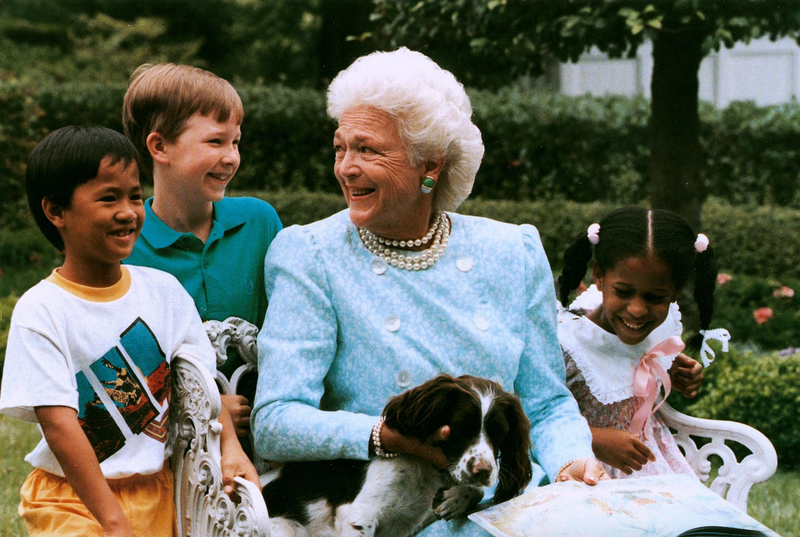 In this photo, First Lady Barbara Bush reads a story to children with Millie. President George H.W. Bush’s dog Millie is one of the most famous presidential pets. The English springer spaniel “wrote” Millie’s Book: As Dictated to Barbara Bush, which reached the top spot on the New York Times nonfiction bestseller list in 1992. In the book, Millie describes a day in her life living with President and Barbara Bush at the White House, including attending morning briefings and afternoon meetings in the Oval Office combined with short breaks for squirrel hunting. Millie was also famous for the prominent mention the president gave her during his bid for re-election. “My dog Millie knows more about foreign affairs than these two bozos,” Bush said, referring to his opponents Bill Clinton and Al Gore. Named for Mildred Caldwell Kerr, a longtime friend of the Bushes, Millie has the distinction of being the mother of two other White House pets: Ranger (often called Bush’s favorite dog) and also President George W. Bush’s dog Spot. 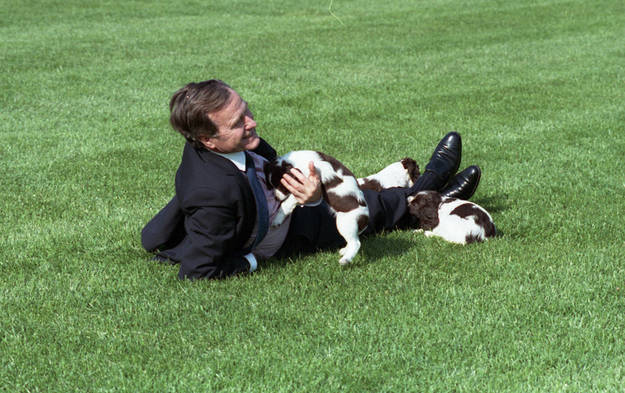 President Bush plays with Millie’s puppies. Millie was portrayed in several TV shows during the 1990s, including Murphy Brown, Wings and Who’s the Boss. She also made a cameo appearance in an episode of The Simpsons. Millie died of pneumonia in 1997 at age 12. The 15-acre Millie Bush Bark Park, which opened in 2004 on the west side of Houston, is named after her. President George H.W. 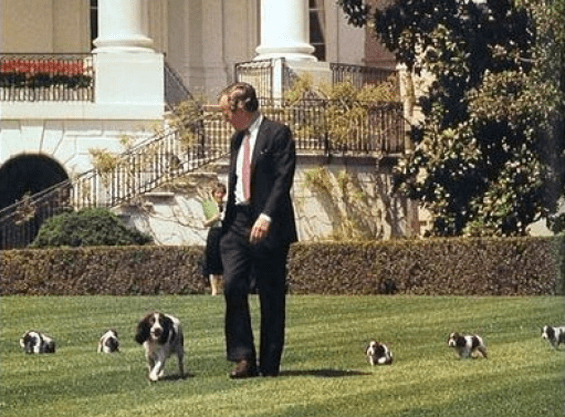 Bush with Millie and puppies, April 20, 1989. Ranger and Spot were among the six puppies.